Surveying your yard you realize your landscaping is looking a little sad. Don’t despair. You can blend the utility of an outdoor space and the beauty of a landscaped yard with some proper planning. Most spaces created by Jeff Kuffel, a landscape architect with Hoffman Landscapes, fall into one of two categories: areas designed for entertaining and areas designed to be sanctuaries. Spaces designated for entertaining tend to be closer to the house. Emphasizing the flow between indoors and out allows guests to easily transition outside after dinner. Meditative spaces, according to Kuffel, are better suited to areas of the yard that are more secluded. Types of plants vary depending on the function of the area. A more wooded site would require shade-loving plants, a common feature of quiet, intimate gardens. 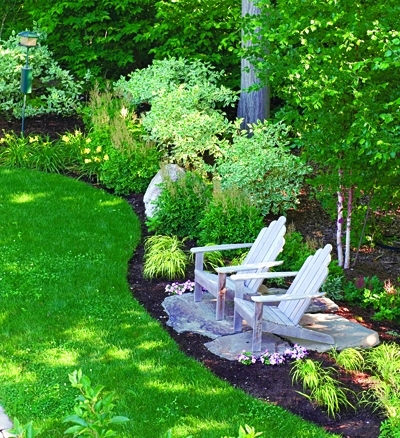 A subdued, greener, softer palette often works better in these areas, flush with ferns and hostas and similar plants. Their perennial status means less work to replant each spring. Astibles or similar, more colorful perennials can be used to brighten up a shade garden. Closer to the house, bigger pops of color appear in sun-loving beds, pots, or planters. In any case, the best time to begin planning is the late fall or winter season. That’s soon, so let’s go. discuss the basics of Medicare and your coverage options. March 27 through May 15. Hotchkiss School for over 25 years. Please register for the free class at www.noblehorizons.org or call 860-435- 9851. 28mar(mar 28)10:30 am30may(may 30)12:00 pmAging Mastery Program ! Make the years ahead of you your best years! If you are 55 or over and would like to navigate a longer, healthier life while improving your financial security and over all well-being, sign up for the National Council on Aging’s free Aging Mastery Program (and complimentary lunch) at Noble Horizons on Thursdays March 28-May 30, from 10:30-noon. A remarkable 98% of AMP participants across the country report an improved quality of life after completing the class and 99% described it as FUN! There is no fee to enroll, but the program is limited to the first 25 registrants. Class members will receive engaging materials and enjoy expert speakers, interactive activities, group discussion, peer support and small rewards to achieve measurable results. Each week a professional will share their expertise on topics that include improving sleep, healthy eating and hydration, financial fitness, medication management, advanced planning, healthy relationships, fall prevention, sustaining an exercise program and community engagement. Registration is required at www.noblehorizons.org or 860-435-9851. Beautiful works of art will be displayed in New Morning Market’s café throughout April and May courtesy of the Watertown Art League. The aim of the Watertown Art League, Inc., a non-profit organization, is to supplement the cultural life in our area by creating artistic activity and appreciation. Paintings are for sale throughout the exhibit. 04apr(apr 4)10:30 am06jun(jun 6)12:00 pmAging Mastery Program ! The Color of Light, premiering on April 4th and performing thru April 28th, brings to light a little-known story about the passions that drove the world-renowned artist Henri Matisse to abandon his beliefs in order to help—and to ultimately honor—the young nun who gave him new reason to live. It is also the backstory of the creation of the world-renowned Chapelle du Rosaire (AKA “the Matisse Chapel”) in Vence, France, a town on the French Riviera. Lynda O’Connor is a local artist who is inspired by the abundance of nature in Litchfiield County. Her artwork is about connections- connections between people, between people and nature and connections between line and shape, color and space. The painting process is led by intuition. excavate back until the final image emerges. Her work is beautiful and affordable. simplicity”. Life quite simply as a force of nature captured on canvas. the b highlights a roster of both local and international artists. sitcom “Frasier” and is frequently featured in major Hollywood films. International and most recently to MOMA’s collection. 11apr(apr 11)10:30 am13jun(jun 13)12:00 pmAging Mastery Program ! Widely published, John Kane has illustrated magazine pieces and several books including The Human Alphabet with Pilobolus Dance Theater, Fashion and Color, and Twisted Yoga, also with Pilobolus Dance Theater. His credits include many of the biggest consumer magazines as well as books and photo essays on fashion, travel, food and modern dance. Publisher’s Weekly says, “Kane’s transcendent images of the colorfully and sometimes scantily clad (dancers) in action elevate viewers to a higher state of consciousness,” “a mind-bending collection of photographs”. The School Library Journal describes Kane’s work “as a stunning visual feast.” John’s work is in private and museum collections internationally. A small sample of larger prints from work with independent dancers as well as well-established dance theater companies MOMIX and Pilobolus in addition to a new series of “post-industrial abstracts” titled ARTIFACTORY will be on view at The Judy Black Memorial Park and Gardens through May 26th. An artist’s reception is scheduled for May 25thwith performances by dancers from MOMIX and Pilobolus dance companies. Winter Is Coming to the Bedford Playhouse. We’re nearing the end of an epic era…and Bedford’s getting bloody. As White Walkers descend on the Playhouse, you won’t want to miss a GAME OF THRONES party series like no other. 18apr(apr 18)10:30 am20jun(jun 20)12:00 pmAging Mastery Program ! Visit The Aldrich for FREE the third Saturday of each month! See the latest in contemporary art and participate in a family-friendly art-making workshop in The Studio. Inspired by exhibiting artist N. Dash, visitors will create their very own works of art out of adobe clay. includes a continental breakfast; the afternoon program includes healthy snacks. Don’t forget to bring cameras and a basket. adult. Pre-registration is necessary; sessions may sell out. www.ctaudubon.org/2019/03/egg-hunt-5/ or call: 203-259-6305, ext. 109. $10/child for CAS members; $15/child for non-members; $5 for all adults. A person’s quality of life can be significantly impacted when suffering from asthma. Dr. Shawn Carney, a naturopathic physician at Northeast Natural Medicine, LLC, will describe potential causes of asthma including inflammation, food sensitivities, and environmental allergens. Dr. Carney will also discuss how to identify and address these problems using natural medicines, avoidance of certain substances, dietary recommendations, and lifestyle approaches. Drop your kids off for a little paint, play, and namaste while you get some shopping done and enjoy our cafe! Kids will explore basic yoga poses and breathing techniques through engaging picture books, creative movement, and play. After movement, kids will work their imaginations exploring a variety of colors, textures, and techniques to create a fun and unique art project each week. Courtney is the owner and founder of The Clever Crayon: a business providing art, yoga, and science classes for children of all ages, ranging from infants to adolescents. She is a certified yoga teach for children and teens through Childlight Yoga. Combine your New Morning “Senior Day” shopping with an hour of gentle yoga. Classes focus on releasing tension, connecting with the breath, and working with the joints. Gentle yoga helps balance a hectic lifestyle and is appropriate for all ages. It’s also beneficial for those aging bodies that tend to lose flexibility and mobility. Instructor Art Rodia has over 38 years in yoga instruction and has trained at Kripalu Yoga Center in Lenox, MA and at Jiiva Yoga Center. His class welcomes people of all backgrounds and fitness levels. Each class includes stretching to remove tension, breathing methods (Pranayama) to calm the nervous system and slow-motion postures (asanas) to lengthen, strengthen, and tone. 23apr6:00 pm8:00 pmWhat is Ayurvedic Medicine? its totality and epitomizes a true body-mind approach to health and wellness. results in disharmony and illness can result. Join us for a fun night where you will learn how to make a variety of nontoxic household cleaners just in time for spring cleaning! Participants will leave with recipes and will also be able to make and take a few of their own DIY cleaning products home to try. All attendees will receive a $5 coupon valid toward their next purchase at New Morning Market. The group will work in acrylics and move on to dabble in other mediums including pastels, pen and ink, mixed media, and more. The program is free. Participants needs to bring supplies from a list provided by Nina. No registration or experience in art is required. Life and Gardens of legendary landscape architect Beatrix Farrand. A Film Screening with six time Emmy Award filmmaker Karyl Evans. April 24th 1pm Burr Homestead 739 Old Post Road Fairfield. Life and Gardens of legendary landscape architect Beatrix Farrand. A Film Screening with six time Emmy Award filmmaker Karyl Evans. April 24th 1pm Burr Homestead 739 Old Post Road Fairfield. All proceeds benefit renewal of the the Burr Gardens . Tickets can be purchased at FAIRFIELDCT.ORG/BGAC. This is the first documentary ever produced about the life and gardens of the most successful female landscape designer in 20th century America, and the only female charter member of the American Society of Landscape Architects. This compelling film chronicles the life of Beatrix Farrand, niece of Edith Wharton, who grew up in the privileged world of the East Coast elite and fought through the challenges of working in a male-dominated profession. The film takes viewers on an inspiring journey across the country and explores her personal story and many of her most spectacular gardens. Over a 50-year career, she completed design commissions at the White House, the Morgan Library, the Peggy Rockefeller Rose Garden at NYBG, campus designs at Princeton and Yale, Dumbarton Oaks in Washington D.C., the Abby Aldrich Rockefeller Garden in Maine, and many more. Six-time Emmy Award winner Karyl Evans will respond to audience questions following the film. Tickets are $25 each. All proceeds go directly to protect, maintain and improve the four-acre property of the historic Burr Homestead. Glenn Hughes, former bassist and singer of Deep Purple, known to millions as the ‘Voice of Rock’, Rock and Roll Hall of Fame inductee, and the current front man for rock super group Black Country Communion is pleased to announce that he will be performing Deep Purple only material with his “GLENN HUGHES PERFORMS CLASSIC DEEP PURPLE LIVE” nationwide US tour in August-Sept. 2018. Deep Purple took a quantum leap when the then 20-year-old Glenn Hughes was seconded from British funk-rock outfit Trapeze in mid-1973. As bassist and co-vocalist (with David Coverdale), he helped steer the legendary rock group in the progressive direction of Burn (1974), Stormbringer (1974) and Come Taste the Band (1975), while touring the world for three years. His solo debut album Play Me Out (1977) preceded later albums with Black Sabbath and Gary Moore. The last 25 years have seen a rush of solo work and collaborations for the ‘Voice of Rock’ including mega hit America: What Time Is Love? with the KLF in 1992, appearances with Joe Satriani / G3 and four critically acclaimed top selling studio albums released between 2010 and 2018 with rock super group Black Country Communion featuring Joe Bonamassa, Derek Sherinian & Jason Bonham. Glenn was also inducted into the Rock and Roll Hall of Fame in 20l6 as a member of Deep Purple. 25apr(apr 25)10:30 am27jun(jun 27)12:00 pmAging Mastery Program ! Join us for a day and evening of local shopping at the downtown Fairfield Spring Shop and Stroll on Thursday, April 25th with refreshments from 5PM – 9PM. Enjoy special discounts and Complimentary Refreshments! Many participating shops. Check out the Spring Fashion for everyone from apparel, home décor, jewelry, toys, sporting goods, dinner gift cards, best-selling books and more! The Town and Chamber are partnering with @FairfieldMoms again to make it a night not to be missed! The evening will kick off with Happy Hour from 5-7 p.m. at The Chelsea, located at 12 Unquowa Place, which will include special discounts on food & drinks, shopping promotions and free “Shop Fairfield” tote bags, while supplies last. Enjoy a full evening of shopping from 6 p.m. – 9 p.m. and then join Fairfield Moms at their fun after-party beginning at 7 p.m. at The Sinclair, where there will be drink and appetizers specials. The Sinclair is located at 1229 Post Road. In what could be the most enlightening 2 hours you’ve ever spent, this class will show you how you can actually begin using your speaking voice for commercials, films, videos, and more. Most people go about it the wrong way. In this introductory class, you will learn about a unique, outside the box way to break into this creative, fulfilling, and potentially lucrative industry. Voice-overs can be managed on your own terms, on your own turf, in your own time, and with minimal overhead! Whether you choose to pursue voice-overs part-time or full-time, this could be the game changer you’ve been looking for. Learn more about this unique stretching-in-motion program designed to increase mobility, strength, flexibility and relieve joint pain. This event features a 20-minute talk focused on alignment and the benefits of ESSENTRICS® followed by a one-hour standing workout. Bring a beach towel or exercise mat to class. Register by calling 860-601-1714/ $25.00 Pay at door (Class is done in bare feet). Space is Limited. Join us for another incredible evening of music featuring four local singer songwriters performing original music! Doors open at 7pm in New Morning’s 2ndfloor handicapped accessible Community Room. Snacks are available for purchase and donations for the performance are graciously accepted. For more info, contact Doug at 203-266-6688. Pepsi Rock Series powered by Xfinity World Music Series Arrival is the only touring band sanctioned by ABBA, featuring original musicians who toured with the band and authentic costumes from those tours! AllShows.com VIP Party Pass available! Includes priority parking and free house wine and beer from 7:00 – 8:30pm! Available for $25 by calling box office (203) 438-5795! rain or shine. In spring, over 500,000 daffodils bloom in the woodland, where walking paths weave over a meandering brook and through a shady dell. or call The Garden Conservancy toll-free weekdays, 9 a.m. to 5 p.m. EST,1-888-842-2442. The Pound Ridge Historical Society host ‘At Home with Halle’ a narrated 2 hr bus tour of the houses Halle refurbished in the hamlet, including an exclusive visit to his own estate followed by an elegant afternoon tea at Conant Hall. Hiram Halle was a visionary, inventor, art collector, home restorer and philanthropist who moved to Pound Ridge 90 years ago believing it to be “a fine country place.. to enjoy in my retirement.” However, soon he was making his mark on our town. In the depths of the Depression, Halle purchased many derelict old houses and put over 60 local men to work on their restoration. 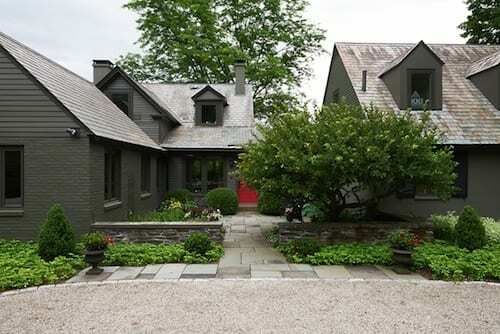 Today those homes, buildings and stone walls till beautiful and benefit Pound Ridge, as do his contributions to the community such as the Fire Department, elementary school, library and “forever wild” lands such as the Halle Ravine. A conversational panel about meaning in abstract and conceptual art centered on material-based artistic practices. Participants include Harmony Hammond (a fifty-year survey of her work is currently on view at the museum), invited artist Indira Allegra, (who has exhibited and performed her work at SFMOMA, de Young Museum, and The Wattis), and art historian Tirza True Latimer, Professor in Visual Studies at California College of the Arts. The panel is moderated by Elissa Auther, Windgate Research and Collections Curator at the Museum of Arts and Design and Visiting Associate Professor at the Bard Graduate Center. RSVP required to Jamie Pearl, Head of Special Events, at jpearl@aldrichart.org, or 203.438.4519, extension 118. Interested in growing your own potatoes? Join us for an informative session! Experienced farmer and gardener Holli will go over prepping, planting, cultivation, and harvest of organic potatoes in your own garden. All attendees will receive a $5 coupon valid toward their next purchase at New Morning Market. 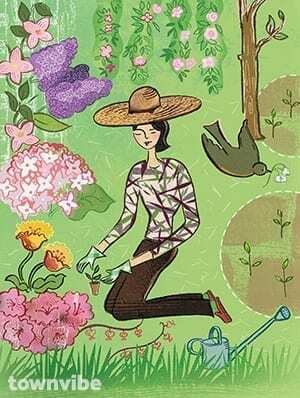 Flower Power: Gardening as a complete workout–who knew? Subscribe to our weekly email! Find out about great area activities & events going on every weekend....plus interesting articles and an occasional special offer. TownVibe is the leading publisher of high-quality lifestyle magazines and digital products for the nation’s most sophisticated, savvy, and sensible readers.